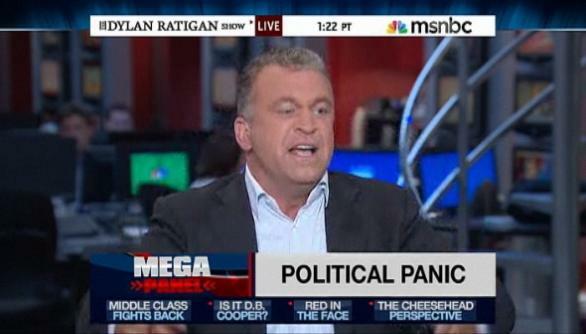 MSNBC's Dylan Ratigan is mad as hell about the U.S. financial crisis--and he's not gonna take it anymore! While convening a roundtable discussion on the market meltdown on his eponymous MSNBC show on Tuesday, Ratigan exploded. "We've got a real problem!" an exasperated Ratigan shouted. "This is a mathematical fact! Tens of trillions of dollars are being extracted from the United States of America. Democrats aren't doing it, Republicans aren't doing it. An entire integrated system, financial system, trading system, taxing system, that was created by both parties over a period of two decades is at work on our entire country right now. And we're sitting here arguing about whether we should do the $4 trillion plan that kicks the can down the road for the president for 2017, or burn the place to the ground, both of which are reckless, irresponsible, and stupid." "I'm sorry to lose my temper," he continued. "But, I tell you what, I've been coming on TV for three years doing this, and the fact of the matter is that there's a refusal on both the Democratic and the Republican side of the aisle to acknowledge the mathematical problem, which is that the United States of America is being extracted." Later, on the show's website, Ratigan called it his "epic 'Network' moment."